The sixth entry into the ‘Our Corner’ Exhibit comes from artist Wei Gan and continues with the theme of bringing a touch of China into our community through the arts. This entry is entitled Autumn, I believe this is to do with the colour scheme the artist chose to use, with muted browns mixed with vibrant reds and greens representing the colours of the season also through her choice of flowers, typically seen during the autumn season in China. Wei Gans preferred art form is traditional Chinese ink painting (learning this from an early age to when she graduated university in the USA) using rice paper and ink she can express herself freely and strive to capture the spirit and movement of a subject or object in her beautiful paintings. Wei has mentioned in the past that birds are a favourite subject of hers to paint as “they are so joyful to watch and a symbol of freedom for the Chinese” and birds certainly play a big part in this exhibit with all but one painting featuring a feathered creature. Wei’s painting style is almost abstract, a brush stroke here and a splash there, but somehow she manages to make these marks and lines come together to create amazing and beautiful pieces of artwork. My personal favourite piece from this exhibit is a small painting of an owl perching on a branch, from a distance it looks like it is almost a coincidence that it looks like an owl, again with a few strokes and splashes dotted around in an almost abstract manner, but upon closer inspection you can see that an amazing amount of detail and pride has been put into Wei’s paintings, the splashes and strokes come together to form a complete picture. 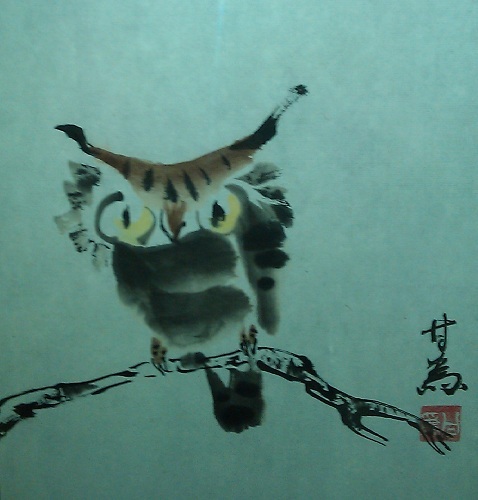 Although the owl is just one example, Wei’s other painting in the exhibition are also breath taking in their own right, again with how abstract, yet not, they are. They will leave you scratching your head at how somebody could make something so simple, yet so detailed look as truly beautiful as they are. I would recommend that everyone who has a chance to come down to the Pagoda center and take a look at the exhibit does so, admission is free and the exhibit is running from the 3rd of November to the 18th.